March is national nutrition month! As we’re beginning to realize more and more on our journey, nutrition is a huge part of a healthy lifestyle – no matter what age you are. The majority of health issues today stem from the food we eat. The cliché, “we are what we eat”, is true. Food is our medicine! Instead of thinking about what we shouldn’t eat, we should think about we should eat and why.  Apples-Have high cholesterol or high blood pressure? An apple a day really will keep the doctor away. 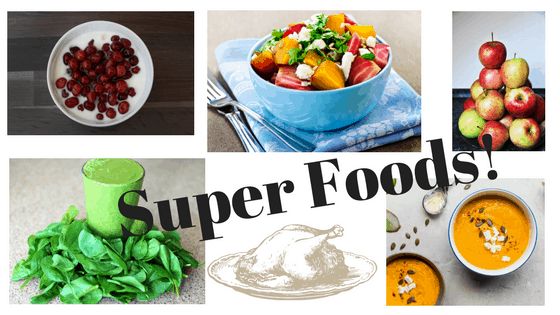 These delicious super foods have the soluble fiber, pectin, which has not only been shown to lower cholesterol and blood pressure, but decrease the risks of colon and breast cancers and can even reduce symptoms of diabetes. Beets-These root vegetables are packed with antioxidants, fiber and vitamin C from their tops to their bottoms. They have been found to protect against cancer, heart disease and help with inflammation. Cranberries-They pack a huge health punch in a tiny form. Outside of its power to protect against urinary tract infections and ulcers, they also contain a surplus of the phytonutrients that offer antioxidant, anti-inflammatory and anti-cancer benefits and have researchers taking a closer look at this amazing berry and what it has to offer, especially the fights against colon, breast, lung and prostate cancers. It’s also a great source of vitamins C, E and K, fiber, manganese and copper.  Pumpkins-They’re not just for pie. This versatile squash is full of fiber and packed with beta-carotene, which turns to Vitamin A in the body, and can reduce the risk of lung cancer. The combination of Vitamin A and potassium can prevent high blood pressure. 綾 Spinach-Popeye knew what was up. This leafy green isn’t just good for the muscles, it’s good for the brain. Researchers have found spinach reduces the deterioration of brain function as we age. It also helps prevent against cardiovascular disease and a variety of cancers including ovarian, breast and colon. 旅 Turkey-Nothing like a nice long nap after a turkey dinner, but turkey actually contains high amounts of niacin and Vitamin B6, key factors in energy production and regulating blood sugar. A 4-ounce portion also contains the trace mineral, selenium, that aids your immune system and gives antioxidant protection. Sounds like a great Thanksgiving dinner, but don’t wait until then to splurge. These and other super foods are best when ingested regularly.